After having several days off from work to celebrate Lunar New Year last week, many TVB artistes are back on the grind and battling sleepless nights. 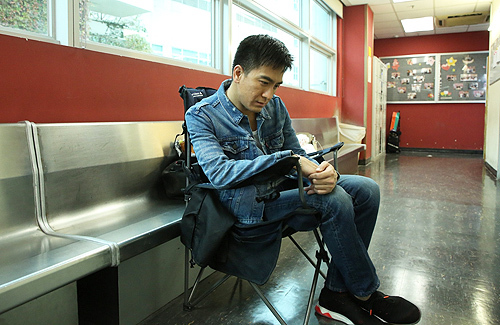 Joel Chan (陳山聰) returned to work to film for the upcoming TVB drama, Chinatown <唐人街>. Directed by Jazz Boon (文偉鴻), the drama also stars Ruco Chan (陳展鵬), Grace Wong (王君馨), Philip Ng (伍允龍), and Natalie Tong (唐詩詠). Joel expressed, “Spending the fourth day of the Lunar New Year like this is actually a happy thing. Returning to work and being able to pass out some red envelopes to my colleagues and wishing them a happy new year is quite delightful. The New Year is starting very well already. I hope that filming for this drama will progress smoothly.” On his first day back at work, Joel had to film for 12 hours, from 2:00 p.m. to 2:00 a.m.
Natalie is also happy to be returning back to work. “I ate too much this year. I need to hurry up and return to work!” Although the filming hours have been long, Natalie has a different way of looking at it. She explained that rather than focusing on how many hours she is filming each day, she instead calculates how many hours she can sleep each day. However, as a contracted TVB artiste, Natalie is used to the grueling work schedule.